Slowly deteriorating to it's pre-teen state as of late (there have been a few days where it has become scarily close to resembling the complexion of a hormonal fourteen year-old), my skin has become significantly more blemished, congested and indecisive as to whether it's oily, dry or somewhere in between recently. The lingering of a sun tan has been the only saving grace in ensuring my skin doesn't look constantly irritated and red; I've come to a bit of a stand-still. Typically, this kind of situation happens before a highly-photographed occasion or much-anticipated party, but as luck would have it, it was timed it with a long weekend off from work so I became fully devoted to the cause and pulled out the big guns to come to the rescue. The 'less is more' approach; minimal make-up (if any), a cleanse-tone-moisturise routine and upping intake of water is my first port of call. Times like these, I cut out anything that seems to over-do it, like AHA masks, toners containing acids and just about anything you wouldn't class as 'simple'. The frustrating thing is always that it's incredibly hard to pin down why our skin can suddenly turn on you, from erratic hormones to using a different kind of water if you've travelled even just a couple of hours up the country (the hard water/soft water conundrum perplexes me), but usually outbreaks do tend to settle down over time regardless of what you're doing (and if not, GP's are probably the next step). I've never thought of myself as having sensitive skin, but this phase would suggest otherwise, and sensitivity isn't something you're born with and can often develop over time, so, I'm adapting. Clay cleansers have been recommended for my skin in the past, as they're really effective for those prone to breakouts. This one contains oil-absorbing Kaolin and green clays which helps to reduce problematic excess oil on the surface of skin. It also contains Menthol which smells (and feels) is really refreshing; particularly great in the morning when you need extra help in waking up (the less dramatic version of a cold shower). Clay cleansers also double up as masks if you leave them on for 10-15 minutes about once a week. Given that this is the year of 'realizing things' (ref. Kylie Jennier, 2017), one of mine has been just how important cleansing your skin, twice a day, actually is. Not only does it prevent a multitude of repercussions caused by dirty skin (premature ageing, blemishes, dullness, need I go on...), it also enhances the efficacy of the products you use after you've cleansed. So, not only does this duo thoroughly clean your skin, it's also a prepping tool for what's to come afterwards. 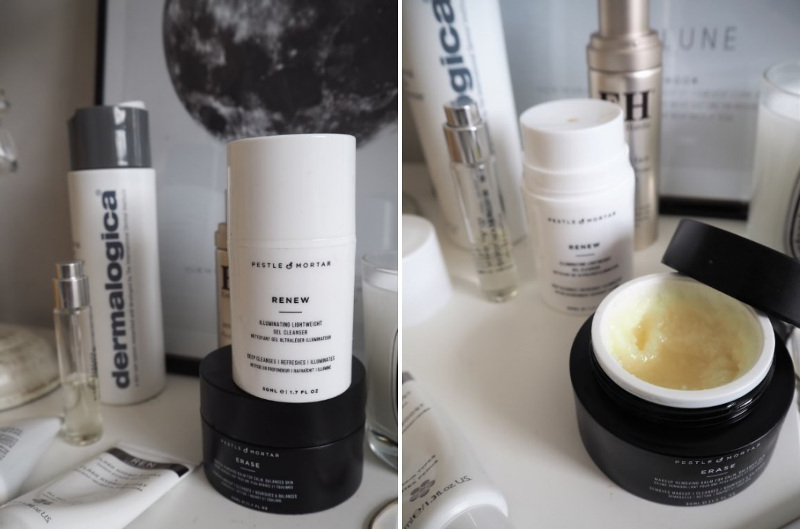 The balm and lightweight gel in Pestle and Mortar's cleansing duo leave skin visibly brighter, feeling silkier and it's very effective in removing all traces of make-up. Since I've been using these, the texture of my skin feels considerably smoother (which is a godsend). You can spend as much time on your skincare regime as you have in the day, but if you're slathering on a sun cream that has no concern for skin (aside from letting the sun damage it) come the summer, then you're probably counteracting the goodness you've worked hard for. Chemical sunscreens can cause irritation, whilst mineral ones can sit on the skin's surface and clog your pores, so naturally the industry has responded by offering SPF's that won't cause your skin to react in such a way. Lightweight, quickly absorbing and one to use underneath make-up (so it slots into your morning routine seamlessly), Emma Hardie's Prime and Protect is a failsafe way of making sure your skin's protected from the sun but won't break you out. If you haven't got the hours in the day to sit around with a face mask on, overnight masks are your new best friend. Working their magic while you sleep, light in texture, orange-scented and formulated to leave your skin dewy, this Decleor sleeping mask is gradually helping to refine the texture of my skin, given it's current state. Containing active ingredients like camomile, sweet orange essential oil and pea extract (which encourages an even skin tone; something I look for in products that sit on your skin), there's a lot of power in this little bottle to make a considerable difference to skin's overall appearance. Incessant bouts of dry skin not only looks dull and undesirable, it also makes the texture of your skin increasingly difficult to apply any form of make-up on, without emphasizing the problem. The vicious cycle of wanting to apply make-up to conceal but in the long term, making the condition worse, is a real nemesis of mine. Hydro-Boost visibly plumps out the appearance of skin, so it's a quick-fix for times when your skin is drier than usual or dehydrated (which it usually is, after a big, summer weekend so this is especially good on a Monday morning). The emulsion is activated with water, and the results are instant. It's one of those products that once you start using it, you never want to be without it. What products do you reach for when your skin takes a turn for the worst?